I could wax poetic about the final days of summer slipping into the horizon like grains of stand through an hourglass. But. Whatever. For me, Labor Day Weekend is the signal of something new, not the symbol of something lost. And while I try not to ever wish away time, I am always glad to see September. In our neck of the woods, probably like yours, Labor Day weekend is about BBQs, pool parties and trips to the beach. So, here is a nice accompaniment that’s easy to put together and travels well. This slightly sweet cornbread calls for three flours: all purpose, corn meal and corn flour. Okay, to be honest, the original recipe called for masa harina. I didn’t have it on-hand and knowingly swapped-in the corn flour (even though one isn’t a substitute for the other). If you are a purist, find masa harina. If not, corn flour will do. 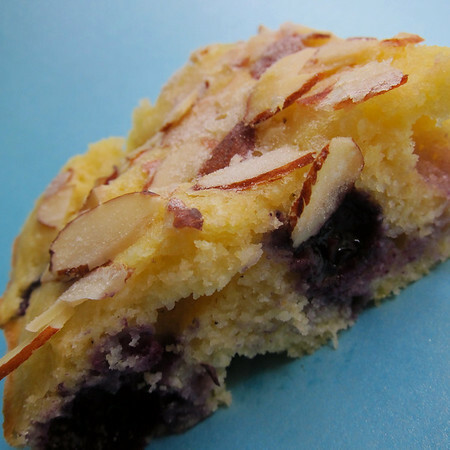 My twist includes lemon zest and sliced almonds. I think the different textures make this simple corn bread interesting. Adieu summer! Bring on the Autumn! Preheat oven to 375 degrees. Butter and line with parchment an 8X8 paking pan. 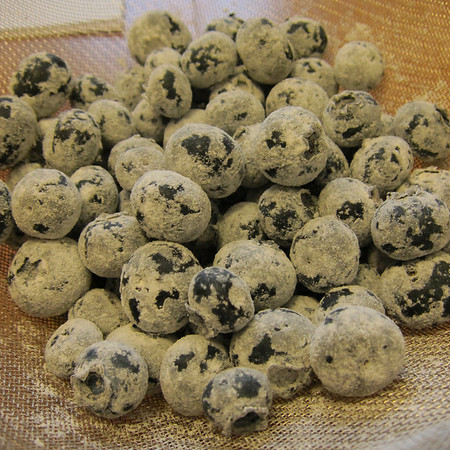 Place clean, dry blueberries in a fine-meshed sieve placed over a bowl. Sprinkle 2 TBS all purpose flour over the berries. Gently toss in the sieve to release extra flour into the bowl. Set aside. In a large bowl, beat eggs, buttermilk and butter to blend. In a medium bowl, whisk together all purpose flour, corn meal, masa harina, sugar, baking powder and salt. Stir flour mixture into egg mixture, fold until all ingredients are just combined. Gently stir-in berries and lemon zest. Scrape batter into pan; spread level. 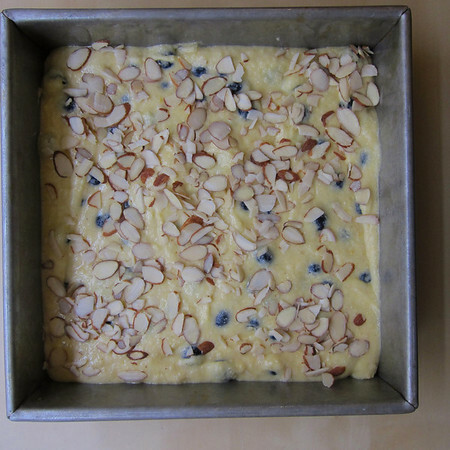 Sprinkle almonds and sugar over the top. Bake until a toothpick inserted comes out clean, about 20 minutes. Allow to cool 10 minutes before cutting.